Extremely popular genre blending science fiction comedy series. Also known as The Melancholy of Haruhi Suzumiya. It started off as a light novel series, which ran from June 6, 2003 to June 15, 2011, written by Tanigawa Nagaru in 2003 with artwork by Itou_Noiji. It has been adapted into an anime by Kyoto_Animation and has received multiple purely comedic spin offs like Haruhi-chan and Nyoro~n Churuya san and the romantic comedy Nagato Yuki-chan no Shoushitsu, which have all been adapted into animation. 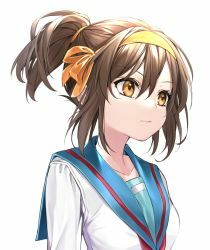 The series has also spawned a popular gender swapped fan work called Suzumiya Haruhi no Seitenkan, which re-imagines the series with the characters' genders inverted. Gender swapped fan art of the characters is also common. It tells the story of Kyon, a sarcastic teenager who likes to think of himself as a perfectly normal guy. On the first day of school, the standard classroom introduction gets a surprising twist when Suzumiya Haruhi introduces herself by proclaiming that she only wants to associate with aliens, espers, and time travelers. 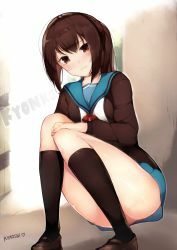 Kyon, like everyone else in class, is perplexed by Haruhi and her anti-social behavior, but he nevertheless manages to strike up a conversation with her. Haruhi takes a liking to him and drags him and Asahina Mikuru into forming the SOS Brigade with Haruhi as the leader. Quiet bibliophile Nagato Yuki and transfer student Koizumi Itsuki also join the club. Everyone in the club seems to be dragged into whatever crazy scheme Haruhi has by the force of her personality, but Kyon learns that there is much more to Haruhi and the other members than meets the eye, and that Haruhi's dream of meeting aliens, espers, and time travelers is not as impossible as it may seem. . . It effectively launched the careers of all the seiyuus who voiced the SOS Brigade, and the anime in particular is famous for the Hare Hare Yukai dance in the ending animation. Not only did the SOS Brigade voice actors reprise their roles for subsequent Haruhi related works and Lucky Star, but they also reunited on the otherwise unrelated 2007 anime Dragonaut the Resonance. 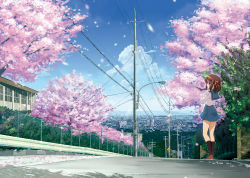 The anime adaptation was also Kyoto Animation's major breakthrough as a studio and led to them working on more adaptations of various light novels/visual novels/manga. The anime adaptation was directed by Ishihara Tatsuya and the soundtrack was composed by Kousaki Satoru. The 2006 anime was originally broadcasted in anachronic order, but upon being released on DVD, the episodes were shuffled into chronological order. 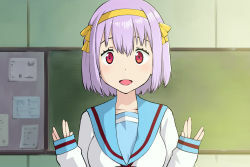 The next episode previews of the original broadcast featured comedic banter between Haruhi and Kyon while the chronological order previews featured Yuki straightforwardly telling viewers to watch the next episode. The second season was also broadcast in an unusual fashion. It was broadcast alongside a rerun of the first season; the first episode was broadcast right after the seventh chronological episode of the first season. There is also an anime film, Disappearance of Haruhi Suzumiya that adapts the fourth light novel of the same name. The series is primarily a blend of science fiction and high school slice of comedy, but, in part due to Haruhi's desire to have all sorts of crazy adventures, the series frequently dips into other genres depending on the arc. The series and its characters are often open to a wide variety of interpretations due to its protagonist Kyon's unreliability as a narrator, which casts doubt on whether any of the events in the series can be taken at face value. The anime also notably creates ambiguity over whether Kyon is narrating or not by having characters directly respond to what was apparently Kyon's inner monologuing. 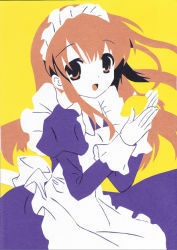 Hirano_Aya, Suzumiya Haruhi's seiyuu, sings most of the vocal music featured in the anime. Suzumiya_Haruhi_no_Shoushitsu also the title of 4th novel of Suzumiya Haruhi no Yuuutsu. Lucky_Star anime adaptation has numerous references to this series. Suzumiya_Haruhi_no_Seitenkan -- The Gender-bending of Haruhi Suzumiya.